Offline Viewer, working online during an outage, displays the affected area and customers and the status of the event. Say “power outage” and most people think of storms. Of course, storms can cause power outages, but even during the best weather, linemen must manage outages caused by car crashes that damage poles, animals that tamper with lines, and other things that interrupt service. To maintain service to customers, linemen need to pinpoint the source of a problem, know where to go for a service call, and identify an asset in the field. Union Power, an electric distribution cooperative headquartered in Monroe, North Carolina, serves more than 70,000 members in Union, Stanly, Cabarrus, Mecklenburg, and Rowan counties. It needed to give linemen and other staff maps that work with live and cached data in the field to help them pinpoint outages and deliver services. Beginning in 2012, crews could access the Union Power operations dashboard in the operations center by using an air card (wireless broadband modem used for connecting to cellular networks) and ArcGIS Viewer for Flex running on ArcGIS for Server. Unfortunately, lots of things interfere with connectivity. Wireless providers often have dead zones, internal IT issues such as routine server maintenance can interrupt data services, and cell towers can be damaged during big storms, which means that the utility’s linemen can’t always get online. By simply sliding the switch on the upper left of the interface, workers can take the device offline and work using cached data. There were other issues with this approach. In many cases, laptops would go months between updates. If a laptop was stolen, Union Power had no way of getting the data off it. Although sensitive data was not kept on laptops, the utility didn’t want any data accessed by unauthorized personnel. Union Power recognized the inefficiencies in this system and knew it could be improved. It decided to work with Swova, an Esri partner and provider of GIS services, to build an iPad solution that would improve its processes and provide fast caching for the more than half a million features in its system. 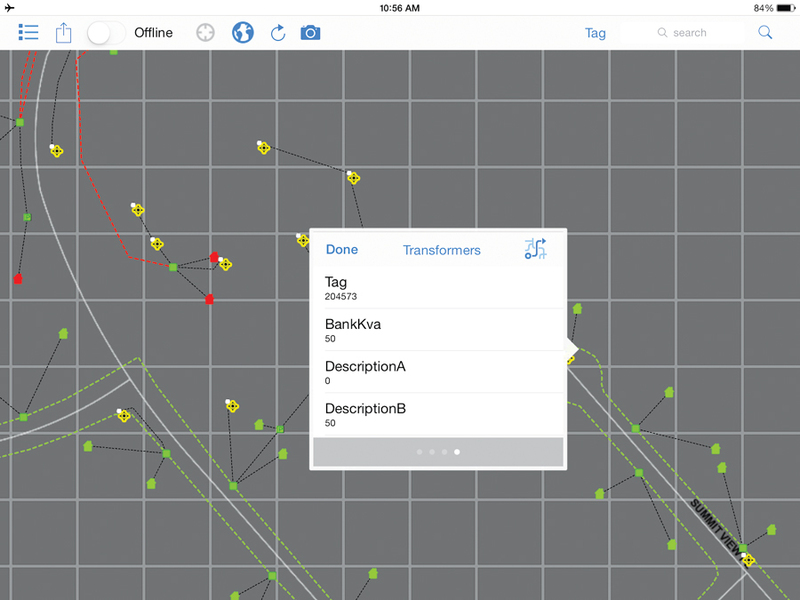 The solution, Offline Viewer, helps linemen locate job sites, see the work they need to do, and search for service orders and assets. It is also used by underground inspectors to see where lines are located. Now, if any device is lost or stolen, data can be removed from it remotely. Offline Viewer shows live data when online and cached data when crews go offline. The viewer caches features such as meter locations, secondary and primary wires, transformers, switches, reclosures, fuses, and access points. Because crews have automatic vehicle location tracking their vehicles, engineers can use Offline Viewer to see where crews are located, which is especially handy before energizing a line. While crews do not collect data in the field, they take photos and include notes with those photos. 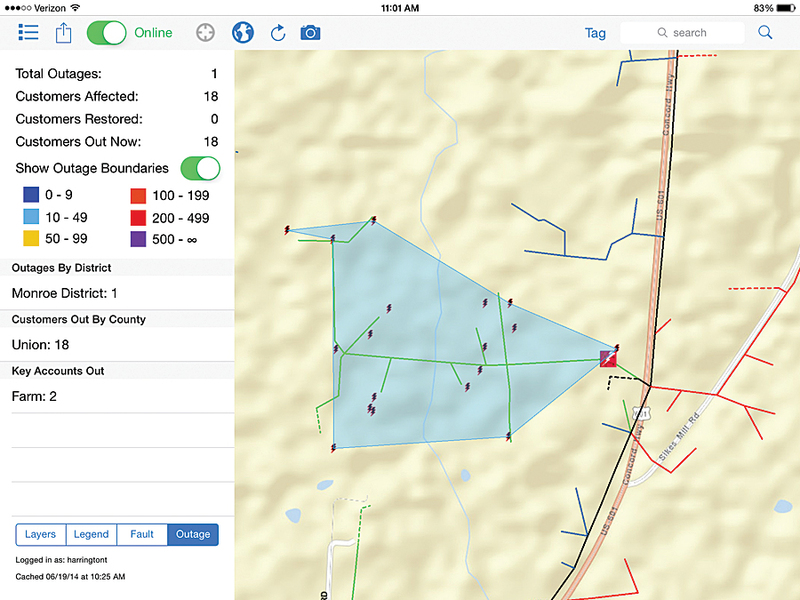 With Offline Viewer, photos are sent directly to the utility’s GIS-based operations dashboard rather than being stored on iPads, which would require uploading to the operations dashboard later. Union Power stores GPS coordinates with asset data to allow for precise and accurate location of its assets. All assets are tagged with a six-digit tag number. Crews can search by name, meter, or tag number. When crews are in the field, the map zooms to their location so they can identify nearby assets. The iPad app is directly tied to the operations dashboard in the operations center, and it contains most of the features from the dashboard. Union Power’s operations dashboard was built using the Operations Dashboard for ArcGIS that comes with ArcGIS for Desktop. Consequently, if the GIS department wants to add more features to this configurable mobile app, staff can do that without writing any code. 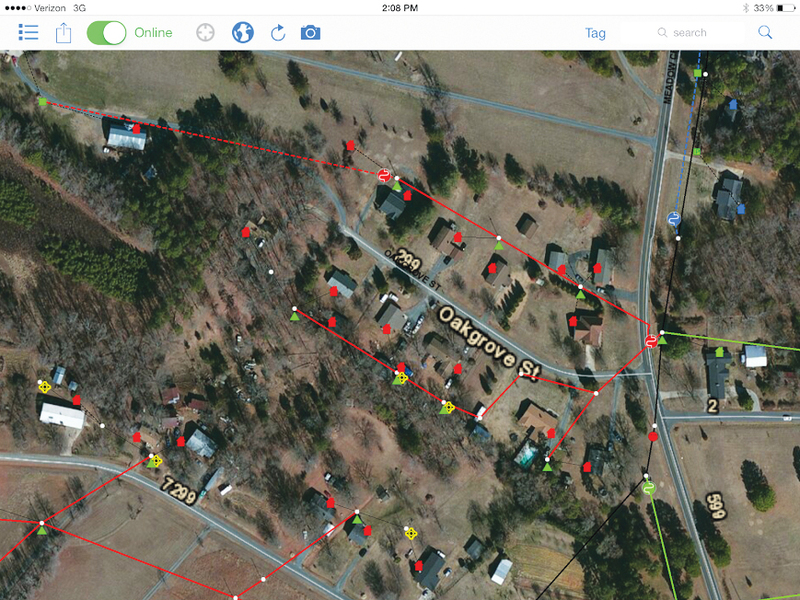 When linemen have connectivity, they can use aerial map services provided by Esri to get more contextual information. Giving linemen the ability to see the same data the operators see in the operations center is especially helpful during outages. Maps help them know how lines are fed and where the devices that need to be checked are located. The GIS model, based on work by Esri partner Futura Systems, Inc., runs connectivity and validation checks to ensure that the best quality geometric network is being used by the outage system, Milsoft Outage Management System. The GIS model lets Union Power predict the origin of an outage. “The guys use it to check fuses and patrol the lines. We can track them throughout the process instead of calling each other to determine where crews are,” said Harrington. When troubleshooting outages, a fault current search in the application helps crews pinpoint problems so they don’t have to drive the line to find clues—like a fallen tree on the line—to determine where the outage originated. Linemen like using the app. They aren’t wasting time patrolling lines. Instead, crew members go to the substation and pull the readings off the relays to see fault current data on their iPad map. They get a range of sections of wire that meet that criteria, and this usually puts them near the problem. For more information, contact Todd Harrington, Union Power.